Preparing a child for kindergarten—and school readiness in general—is one of the most important goals of early childhood care and education. While most educators and childhood development experts would agree that physical and behavioral health plays a major role in a child’s readiness for kindergarten, Oregon and other states have struggled to determine how to measure and track progress in these areas. A workgroup convened by Children’s Institute and Oregon Health Authority (OHA), with support from Oregon Pediatric Improvement Partnership (OPIP) has now issued a set of recommendations which could bring the health sector closer to that goal. 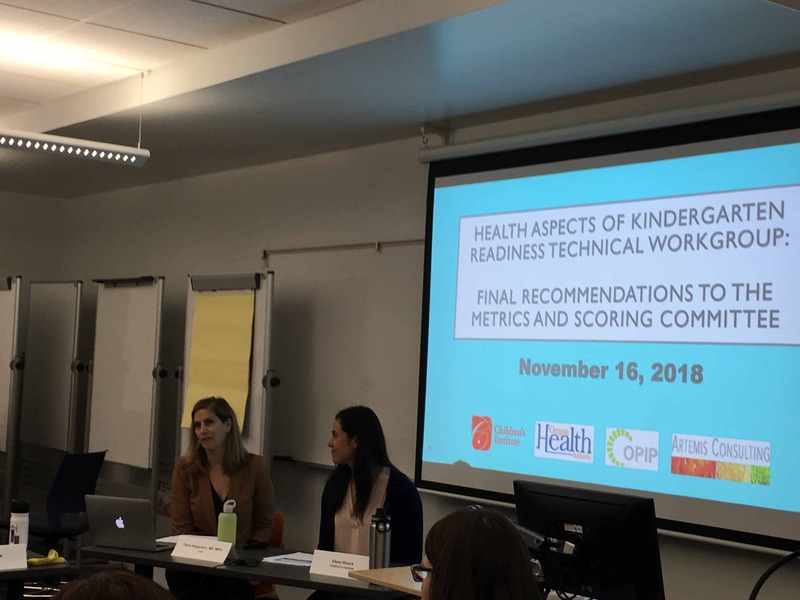 The Health Aspects of Kindergarten Readiness (HAKR) Technical Workgroup prioritized four measures across multiple areas of children’s health and development. The goal is to drive system-level changes and improvements to kindergarten readiness, especially for children served by the Oregon Health Plan (Medicaid). The complete package of recommended metrics was endorsed by Oregon’s Metrics and Scoring Committee last month, a milestone moment in a year-long process incorporating input and expertise from a diverse set of stakeholders. “This has exciting implications for more deeply connecting our health and education systems, in Oregon and nationally,” said Dr. Dana Hargunani, chief medical officer at OHA. Oregon introduced a statewide kindergarten assessment in 2013, requiring educators to collect information about students’ early literacy and math skills, as well as interpersonal and self-regulation skills. Data from those assessments highlighted the wide variability in readiness, often driven by factors such as family income and access to high-quality early care and education. Researchers, data analysts, and advocates have since called for a closer look at the health aspects of kindergarten readiness, including greater attention to social-emotional factors. 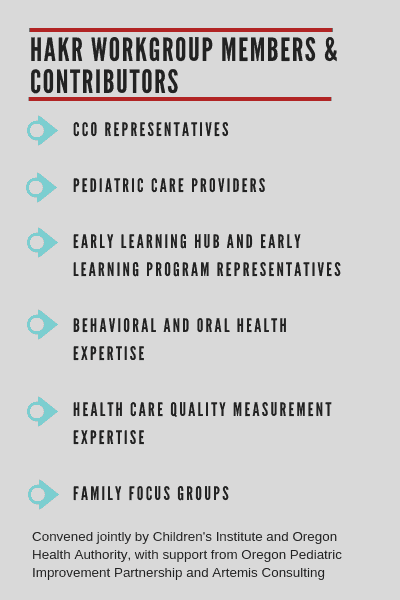 The HAKR workgroup met over nine months in 2018 to research and develop recommended metrics for adoption by Coordinated Care Organizations (CCOs), networks of health care providers serving people on Medicaid. The measurement strategy proposed by the HAKR workgroup includes incentivizing the metrics, meaning that CCOs that demonstrate progress on them could receive bonus payments. The four priority measures included in the final proposal cover familiar areas of children’s health, including dental visits, well-child visits, and follow-ups to developmental screenings. It also includes a new ask—the development of a measure that can help CCOs address social-emotional health. “The workgroup heard from families, pediatricians, and early learning partners time and time again about challenges related to children’s social-emotional and behavioral health, so it was clear that our recommendations would need to have a strong focus on addressing social-emotional health if we wanted to impact the outcome of kindergarten readiness,” said Elena Rivera, Senior Health Policy and Program Advisor at Children’s Institute. The measures pull from multiple data sources and track whether children receive essential preventive care as well as follow-up services to meet additional needs. According to an analysis from OPIP, only 40 percent of children identified at risk of developmental delay received follow-up care, with large variations across providers. Understanding how many children were flagged for a developmental follow-up and whether they actually received a follow-up can offer a more complete understanding of a child’s health history and inform larger efforts to improve health practice and policy, including connections to early learning and family support programs. “We really felt an urgency to recommend metrics that were feasible in the near-term, while also driving toward a more comprehensive set of measures that will cross multiple domains of kindergarten readiness. We recognize that this is truly a multi-faceted, complex, multi-generational interaction that will take time to implement,” said Rivera. Workgroup members believe that implementation of the metrics could begin in 2020 and provide a foundation for further metrics over time. Hargunani and Rivera presenting to the Oregon Metrics and Scoring Committee in November.